The skies cleared on Saturday morning as the winners of the WCDS Annual 5K Fun Run posed for a picture at the finish line. 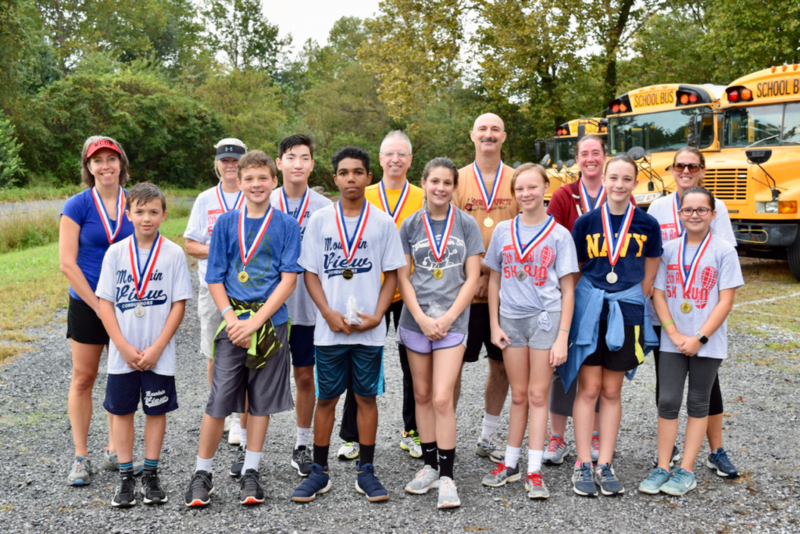 We held our annual 5K Fun Run—a fundraising event for the WCDS Athletics Department— on Saturday, September 22, just ahead of our Family Carnival and Lobster Boil. Twenty-five runners, including a large number from Mountain View Christian Academy, competed in the race that began in light rain and ended as the weather was clearing off. The Top Male Finisher was Eli Smith with a time of 20.50. Smith earned the gold medal in the 13-18 age group. WCDS grandparent Jean Jarrett won the gold medal in the female age group 50+ with a 24thplace finish. The male age group 50+ was won by Chris Foreman finishing 10th, and the silver medal went to WCDS parent Marty Heffron with a 19th place finish. Congratulations to all runners, and we thank everyone for supporting the WCDS Athletic Department, including our volunteers who helped make the race a great time for all: Laura Carter, Mike Costello, Robin Costello, Jessica Lindstrom, Martin O’Heir, Lisa Ramey, Danita Russell, Anna Schuster, and Owen Schuster.